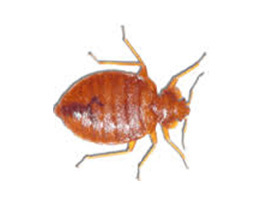 Bed bug pest control and treatments in Staines, Weybridge, Twickenham, Shepperton, Richmond. The bed bug (cimex lectularius) is a nocturnal insect that feeds on human blood. It is generally found living either in or close to a bed or human sleeping place. Thoroughness is essentially to a successful bedbug eradication programme, and as with most pest control, housekeeping plays a major role. Bedbugs are generally active only at night, with a peak attack period about an hour before dawn. Attracted by warmth and the presence of carbon dioxide, the bug pierces the skin of its host with two hollow tubes. After feeding for about five minutes, the bug returns to its hiding place. The bites cannot usually be felt until some minutes or hours later.. Although bedbugs can live for a year or as much as 18 months without feeding, they typically seek blood every five to ten days. Low infestations may be difficult to detect, and it is not unusual for the victim not to even realize they have bedbugs early on.